Not every quilt needs a frame – sometimes those edges just want to be left alone in peace! That’s where a self binding finishing method comes in handy. What do you mean “self binding”? I’ve seen this method referred to as self binding, no binding and the pillowcase method. You’ll go through basting and backing, just in a different configuration. First up, you need to baste your quilt top to your batting. Because I’ve just got a small mini quilt, I used poly batting and some basting spray. 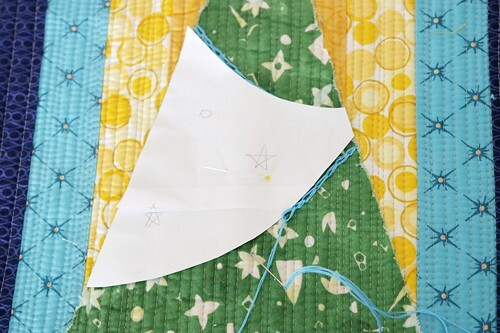 You’ll want to add a few lines of quilting here to make sure your two layers are well secured. Stitching in the ditch along a couple of lines would be perfect. I actually decided to go to town and do most of my quilting at this stage. Why? Because I’m lazy! I knew that quilting when the backing is on will require thread burying, which isn’t my idea of a fun night in. Using my walking foot I straight line quilted, using the seams as rough guides. I quilted it fairly densely as I like my mini quilts to have a fair bit of structure. Once your batting and quilt top are secured (however you decide to go) trim off the excess batting and square it up. 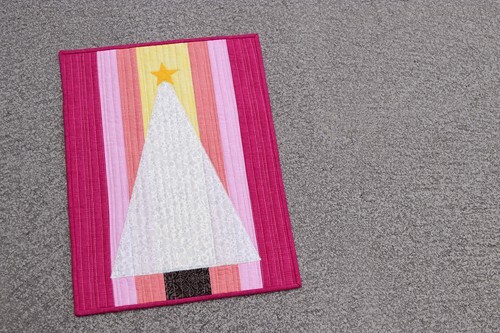 You’ll now need a backing piece the same size as your quilt top/batting piece. Place the top and backing right sides together. 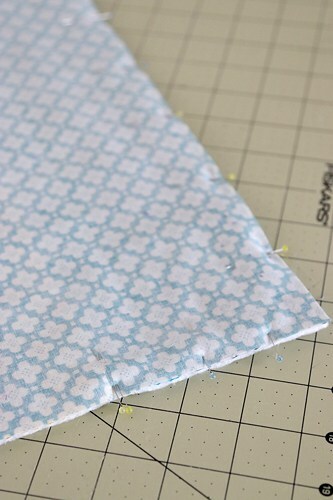 Pin all around the edges, but remember to leave an open section to turn the work right side out after sewing. You can learn from my mistake here – locate your gap along one side so that only one fabric is involved. I left my turning gap along the top of the quilt and it spanned several different coloured fabrics, which makes it harder to match the thread when hand sewing it closed. I’ve pinned my edges above. You’ll see I’ve put two pins in the one spot – that’s my little code to remind me where my turning gap is, so I remember not to sew the whole perimeter closed. I used my walking foot and a 1/2″ seam as the seams are quite bulky with all the layers. If this were a larger quilt I would also zig zag the raw edges or use the “serger” stitch on my machine just to help it stand up to washing better. Once I’ve sewn the backing and top together around the edges I like to take the time to press back my turning gap seams. I find it easier to get them straight from the back side, rather than when the piece is right side out. I also like to trim my corners to make sure there’s less bulk (but be careful not to clip your stitching). Once you’ve pressed your turning gap seams you can turn the piece right side out. Give the quilt another press. 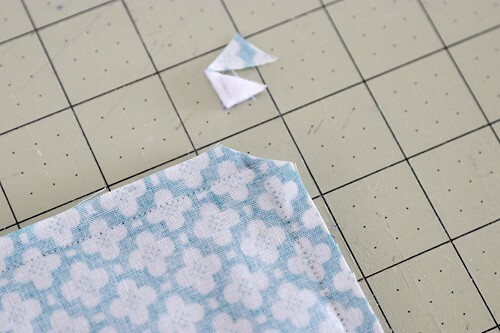 Focus on setting the seams around the edges and making sure your turning gap edges are still aligned and straight. I’ve pinned the turning gap closed below. Now it’s time to whip stitch the turning gap closed with some hand sewing. I like to start with a nice long thread, which I double up. I put both cut ends through the eye of the needle and keep the thread loop at the other end. 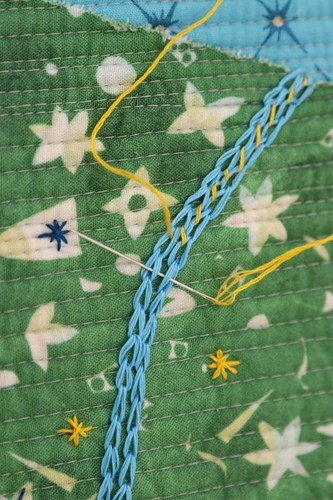 When you take your first stitch, pop the needle through the loop before pulling the stitch tight. This will make the loop close into a sturdy starting knot that will never come undone. It’s my favourite way to tie on a thread. Because this is just a mini quilt I felt that two lines, about a third in from each edge, would work a treat. They’re a bit hard to see below. And again, because it’s a wall decoration and won’t be washed, I just did a few backstitches at the start and end of each line. No thread burying for me! Another good press, and there you have it. If this was a larger quilt, I would have also done a perimeter of “top stitching” around the edge. This would add some extra strength and to help keep the edge seams where they should be. So there you have it – one way of creating a no binding finish, or a self binding quilt. 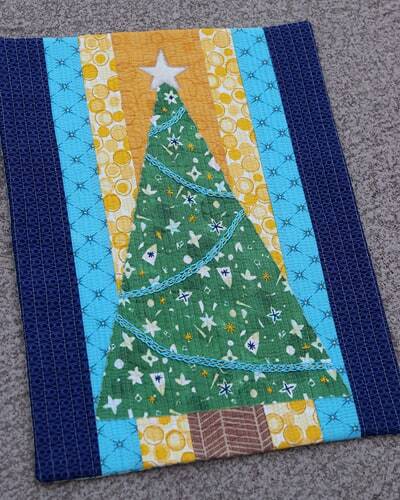 If you like this pattern and would like to make a Christmas mini quilt of your own, you can find the pattern in my shop here. Have you tried the self binding method before? Do you have any tips for young players? I’d love to hear them below. Hello there! I hope everyone had a relaxing, peaceful, family-and-friend-filled Christmas (I won’t say healthy, because that’d be silly). Did Santa bring some more fabric for your stash or maybe a sewing book you’ve been coveting? I treated myself to some yardage for quilt backs, but resisted anything smaller – I really need to work on reducing my stash. To contradict that last statement completely, I only managed to sew one gift this Christmas. Ha! That’s sad. I made this version of Jeni Baker’s awesome drawstring bag for one of my kid’s teachers (filled with soap, hand cream and a lavender satchel). I think this bag looks so festive – it reminds me of a wee Santa sack. From the back there is Missoni (! ), an Ikat print, a white/cobalt super-soft, lawn-like cotton and a smoky blue dobby cotton. 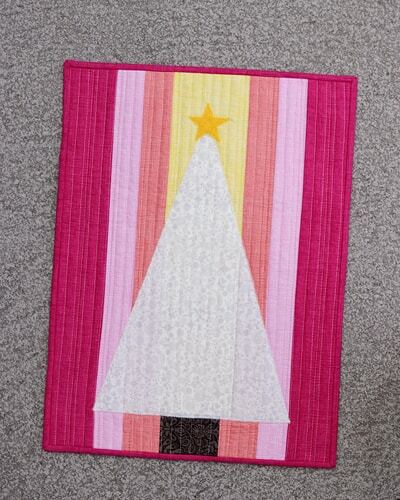 I have managed some other sewing – I finished a sample for my next quilt pattern. Well, I almost finished. I got up to the part where I should hand sew down the binding but met with some furry resistance. It just seems so mean to move a sleeping cat, let alone two of ’em. I’m not sure why they feel the need to sleep on a quilt. Here in Queensland it has been hot and wet, which as we all know is nice when you’re with a lady, but it ain’t no good when you’re in the jungle (or the sewing room for that matter). So while I waited for Rex and Tilly to wake up and move to the cool tiles in the kitchen, I rummaged around my stash to put together some fabrics for a log cabin quilt for my daughter. I’m planning to join in the Log Cabin Quiltalong that starts tomorrow. Tomorrow as in the first day of the shiny New Year. Holy crap, 2015! Can you believe it? Are you excited for the New Year? I know I am, although I can’t really say why. In fact, I’ve been feeling rather joyous and positive and just happy to be alive for the past month or so, so I’m either pregnant or my dabbling in the I Quit Sugar diet is working it’s mojo on my brain chemistry. I hope it’s the later because if it’s the former I am in some deep, deep trouble (the mister had a vasectomy last year). Are you doing the whole setting goals thing again? Meh, I don’t think I could be bothered. I can’t even be bothered reviewing what I didn’t get done this year. I’m going to do a bit of a mini-plan, just for the first quarter of the year. So much changes as the year progresses, I kind of feel like it’s a waste of effort to plan for what I should be doing in 6-12 months time… so much can change between now and then. Maybe I’ll just go with the theme option, choosing a word to guide what I hope to achieve in 2015. Now for some bad news – I’m guessing you’ve all heard about the new process for collecting VAT on digital products sold to the EU? Yeah, it’s not the most well thought out plan when it comes to small business. Alright, it’s time for me to go and prep some food for New Year’s Eve celebrations. And now that the cats have moved onto the ironing board I could even fit a little hand sewing in before festivities begin. I wish you all, from the bottom of my heart, a happy, healthy, fulfilling and prosperous 2015.